Gallstone pain manifests as a severe attack, which can leave the sufferer feeling like they have just gone through the worst experience of their lives. Because of the intensity of the pain, many are seeking for a solution to alleviate these pains, or stop them altogether. Usually, gallstones do not disappear otherwise then removed, along with the gallbladder, by the surgeon’s knife, there are some things sufferers can consider in order to make the excruciating pain go away. First, you need to know if what you feel represents gallstone pain or not. Usually, these attacks occur right after meals, and they manifest as incredible abdominal pains that go from the front to the back, up to the right shoulder blade. If you notice a recurrence of this pain that is enough to trigger an alarm signal, you need to go see your doctor and ask what can be done. You will be recommended some tests that will clarify which condition your symptoms come from, as they are common in gallbladder disease, ulcer, and gastro-esophageal reflux. The best way to relieve the pain would be recommended by your doctor. One way to get rid of your gallstones is to force them to dissolve. If they are small enough – some are no larger than grains of sand – there is a high chance that a temporary treatment can help them disappear, and take the pain with them. Such treatments include the usage of a drug called Ursodiol, which will do exactly that, dissolve the stones. Pains will still be experienced during this period, so a medicine for pain is often prescribed by physicians. 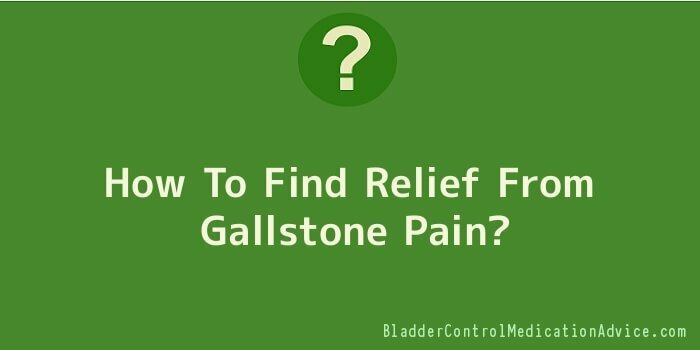 You can also do other things in order to escape the pains caused by gallstones. One is to eat a balanced diet low in cholesterol. Gallstones are basically crystallized bile fluids which are caused by accumulation of salt and cholesterol in the bile. By reducing cholesterol intake, you will be able to give your gallbladder a well deserved break from all the fat rich foods you pumped into it. There are also home remedies that you can try in order to help your body ease the pain. One method recommends taking a hot shower, quickly followed by a cold one, as the shock given to your body helps you get over the pain. You can also try drinking a mixture that combines two parts of apple juice and one part vinegar. The mixture helps soften the stones, and the pain that comes attached to them. Drinking this little by little, each hour, will ease your pains. Gallstone pain is not something you can ignore because of its intensity. For that reason, it is recommendable to consider surgery as a straightforward solution for your problems. If you are preparing for such an intervention that involves the removal of the gallbladder, then you will be able to ease your gallstone pain, by applying some home remedies that are well known to have quick effect of your suffering.